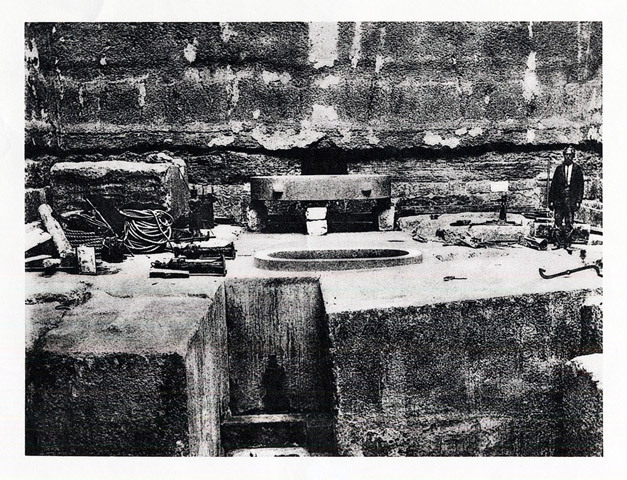 The complicated granite platform or ‘base’ (radier, as Lauer calls it in French) at the bottom of the Zawiyet el-Aryan meridian observation shaft shown in Plate 8. The archaeologist Jean-Phillip Lauer stands at right, giving an indication of the scale. He has no explanation for the nature and purpose of this strange structure. I believe that the oval depression in the centre of this platform was the base for a giant water-clock, which was used to mark the hours of the night while the astronomical observations were taking place in the adjoining meridian observation shaft. The water clock, re-calibrated once a day during daylight hours by a shadow-clock, would have made possible a precise timing of each successive stellar ‘culmination’, since the daytime shadow-clocks could not be used for time-keeping at night. Only by timing every ‘culmination’ precisely could precise calendrical measurements be obtained. (Ancient Egyptian water clocks and shadow clocks survive, as well as texts describing their use, and we know exactly how they worked.) This is Plate 1-B from Jean-Philippe Lauer, ‘Sur l’Age et l’Attribution Possible de l’Excavation Monumentale de Zaouiet el-Aryan’ (Concerning the Age and the Possible Attribution of the Monumental Excavation of Zawiyet el-Aryan’), Revue d’Égyptologie, Tome 14, Paris, 1962, pp. 21-36 with additional plates page. Came across Robert Temples site while researching for the Caviglia's Complaint post on the Vyse/Cartouche thread of Audreys. An interesting view on how stellar mapping and time* as you mentioned was undertaken. This way of stellar mapping may or may not be the way*...they always used. possibly this ability declined over time. Our ability today to roll back the sky via computer programs with adjusted data may prove inaccurate beyond certain time intervals. sufficient mytholore exists which proves planetary upset. Schoch and Laviolette could be correct on T Tauri star-flaring sequence of our Sun around the 10,000bc window. Velikovsky's dynamic solar system hints that orbital divergence/proximity encounters could alter AU sets and obliquity. Your point about change ---timelessness to time. the First Nations peoples/Olmec/Mayan etc ....3rd world upset and then 4th world wandering.....with great fear now imprinted upon mankind. seeing these....and not the Pyramids. The hidden may appear for us....little by little.